It is our pleasure to introduce our brand new flagship FordStores to the people of St. Albans, Stevenage and Harlow. Gates Ford is one of a select number of Ford dealerships across Europe to be appointed FordStore locations, which offer the most in-depth, immersive and technologically advanced automotive showroom experience. 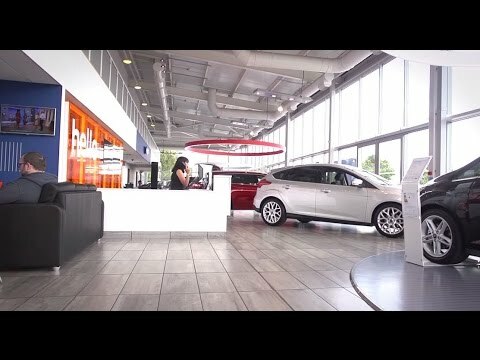 The FordStore experience marks a new horizon for automotive retail providing an extended experience that's innovative, personalised and intuitive. Our new FordStore in Harlow has been completely re-built to give a brand new environment for our customers to discover more about our Ford range of products and services. The new Ford vehicle range is available to view and test drive as you would expect, grouped within relevant “family" displays to make it easier to oversee and compare models, and new product areas have also been introduced as part of the FordStore experience. Two new headline vehicle displays have been implemented within the showroom complete with spotlight-style halo lighting and flooring. These have been designed to showcase particular vehicles within the FordStore line-up including ST models, the forthcoming Mustang, Focus RS and Ford Edge SUV ranges. Providing the very highest levels of quality and craftsmanship, the exclusive Vignale brand is available at all of our dealerships. A brand new Vignale lounge, a premium area that embodies exclusivity, has been introduced at our FordStores in St. Albans, Stevenage and Harlow, where customers can experience the Vignale brand and personalised service at their leisure. Ford Vignale brings together award-winning design with a unique-ownership experience and is available on selected models including the new All-New Fiesta, All-New Focus, S-MAX and Galaxy. Choose from the links below to learn more about FordStore or contact Gates Ford today. Discover Ford like never before in our state of the art FordStore, divided into easy-to-navigate zones. The only place to get the new Ford Mustang and other performance vehicles like the Ford Focus RS. The new ultimate luxury range of Ford vehicles are available as Ford Vignale. Learn more about what Vignale is. Computers, Tablets and big screens are all available to customers to research and learn about Ford products and services. Visit our FordStores in St. Albans & Stevenage, Hertfordshire, and Harlow, Essex to understand more about what is on offer.